We Help Entrepreneurs Develop Successful Businesses! 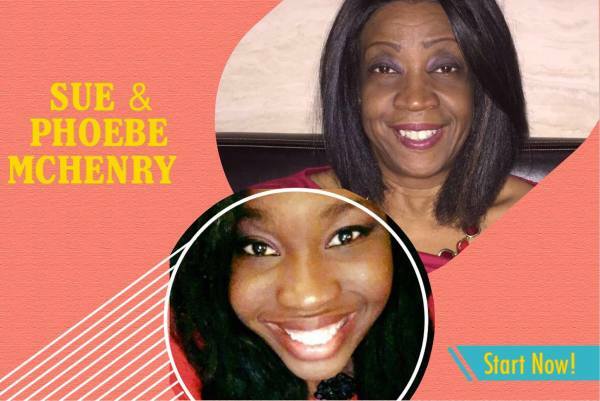 Sue & Phoebe are a mother/daughter business duo who, like most, suffered greatly when the economy crashed in 2008. For years they struggled with finances. Sue knew there had to be a better way, so she looked into starting her own online business. In the beginning, it was a constant up and down. How do we pursue and maintain a successful business? What would we sell? Will it actually allow us the financial and time freedom we are truly looking for? Like with most small businesses they invested, with no real direction, time and time again. Time and time again, it always led to the same inevitable ending. In 2014, Sue was introduced to Affiliate Marketing. She knew it was the path to gaining her family's financial freedom, back. Now they are successfully continuing their path to financial education and freedom. Sue is on track to retire from the corporate world, for good. Further, she will be allowed the time to enjoy her love of Fine Wine, Home Decor and Traveling the Jazz Circuit. Phoebe is on track to be financially free enough to retire in her 30's. Giving her the time she needs to continue pursuing her acting career, blog/vlog her travel experiences and enjoy a more active social life. They now have a successful business set up and enjoy life, travel and spending time with their husband and father, Gle-en, as he continues in his love of Public Speaking and Sales Training around the country. This Mother/Daughter duo's passion is helping those with a serious interest in entrepreneurship achieve their business goals, without all the pitfalls they had to suffer through. If you are ready to start your business and take your life back, be sure to click our picture below and leave us your email. Let us help you start now!